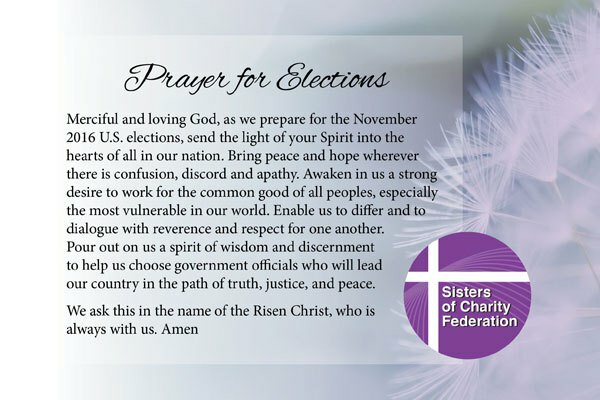 The Sisters of Charity Federation members at their recent meetings committed themselves to joining in prayer and fasting for wisdom and discernment as the U.S. moves toward national elections. As women religious, prayer is at the very core of whom we are as servants of God, and prayer is part of every aspect of our lives, and that includes praying for our world, our country, all citizens, and those who govern. We pray in thanksgiving for the privilege and responsibility of being able to organize as individuals politically. We pray that each of us, as citizens, feel compelled to exercise our right and responsibility to vote. We pray for all to make decisions and vote based on their conscience. We pray for leaders who will make decisions for the good of all, especially the least among us. We pray that God will protect all candidates and their families, and give them strength and wisdom. We pray not just for the candidates but all leaders and for the nation. To make it easier they even offer the following prayer card. Why not take the time spread the word about this campaign! Remember in Your Prayers +Fr. Robert Prior, C.M. Please remember in your prayers Fr. Robert Prior, C.M. died peacefully last night in St. Catherine’s Infirmary. que murió anoche en la enfermería St. Catherine’s. Detalles del funeral están pendientes. Prayers Requested for Fr. Robert Prior, C.M. Please remember in your prayers Fr. Robert Prior, C.M. who is in grave condition at St. Catherine’s Infirmary. que está en condición grave en la enfermería St. Catherine’s. Before you answer let me refine the question. Who are the people who have influenced your lives? They are probably many even if you never thought of them under the title of hero. Just as you may never have thought of them under the title of saints. “The Saints Next Door” and The “middle class” of holiness. in the sick, in elderly religious who never lose their smile. In their daily perseverance I see the holiness of the Church militant. Very often it is a holiness found in our next-door neighbours, those who, living in our midst, reflect God’s presence. We might call them “the middle class of holiness”. He continues “Holiness is the most attractive face of the Church.” But what is this holiness? “Each in his or her own way” the (Second Vatican) Council says. We should not grow discouraged before examples of holiness that appear unattainable. There are some testimonies that may prove helpful and inspiring, but that we are not meant to copy, for that could even lead us astray from the one specific path that the Lord has in mind for us. The important thing is that each believer discern his or her own path, that they bring out the very best of themselves, the most personal gifts that God has placed in their hearts (cf. 1 Cor 12:7), rather than hopelessly trying to imitate something not meant for them. We are all called to be witnesses, but there are many actual ways of bearing witness. 8. Let us be spurred on by the signs of holiness that the Lord shows us through the humblest members of that people which “shares also in Christ’s prophetic office, spreading abroad a living witness to him, especially by means of a life of faith and charity”. This All Saints Day and All Souls Day let us pray in gratitude for the heroes and saints next door in our lives! This extraordinary journey began as a followup to his confirmation catechesis in our parish, St. Joseph’s in Colon, Panama. Then on to two World Youth Days, a ministry as Executive Secretary for Youth Ministry for the Panama Bishops Conference, and most recently an opportunity to actually hug Pope Francis! A moment he never dreamed of… and will never forget! Mr. Yithzak Gonzalez was formed by our Vincentian confreres Alcibiades Guerra and Juan Aviles in St. Joseph Parish. I am sure they did not expect such a journey when they asked him, as a followup to his Confirmation catechesis, to form a youth group. Such are the ways of Providence. Earlier, at the conclusion of the preparatory meeting for the Synod on Palm Sunday, he was privileged to hand the final document to Pope Francis. On this occasion, he not only took a ‘selfie’ with the Pope but even asked the Pope for permission to hug him. Pope Francis readily said yes. See his fascinating interview on EWTN with Fr. Mark where he tells of having the privilege of handing the final document to the Pope. He was delighted when Superior General Fr. Tomaz Mavric CM extended an invitation to the Vincentian Film Festival. Among the renovation projects in Colón expected to be finished for World Youth Day is the renovation of the Cathedral built in the 1930’s, gothic style. Yitzhak was also instrumental in the request of the bishop for a relic of Vincent de Paul for the Cathedral. Yitzhak was named by the Episcopal Conference in January 2018 as Executive Secretary for Youth Ministry. Yitzhak has taken a year off from his regular employment in the Colón Free Zone to help organize World Youth Day. He and his fiancé still participate regularly at our parish. St. John’s University continues to foster the next generation Vincentian Family Leaders. At the assembly, Caitlin was joined by St. John’s students Rachel Burgos, President of the St. John’s chapter of the St. Vincent de Paul Society, a Catholic Scholar, and a Radiologic Sciences major in the College of Pharmacy and Health Sciences; and Chan Henry, the Society’s Treasurer and a Psychology major in St. John’s College of Liberal Arts and Sciences. They collaborated with other youth and young adult Vincentians who share their passion for serving those in need. At a variety of workshops, the group focused on brainstorming ways to increase membership and emphasize diversity among this population in the Society of St. Vincent de Paul. 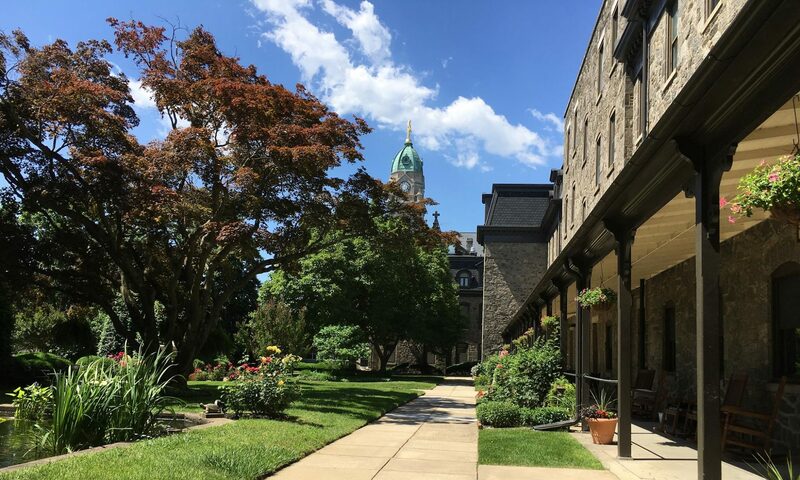 This year, one of the goals of St. John’s University’s chapter of the Society of St. Vincent de Paul is to promote and incorporate the importance of diversity and inclusion within the student body. Members have been networking with other organizations on campus and promoting the Society of St. Vincent de Paul as an inclusive Society that serves and welcomes all. Students listened to a keynote address from Rev. Aidan R. Rooney, C.M., Vice President for Mission Integration at Niagara University, on “Embracing the World: What would Frédéric Do (WWFD)?”. The group analyzed a letter written by Blessed Frédéric Ozanam and were asked to connect what he said about doing for others to the society we live in today. Hosffman Ospino, Ph.D., Associate Professor of Hispanic Ministry and Religious Education at Boston College’s School of Theology and Ministry, presented an informational session on “US Catholicism in the 21st Century,” in which he addressed the needs of the changing world. All youth and young adults who attended the assembly participated in a day of service at PATH (People Assisting the Homeless) in San Diego, CA. They packed toiletry bags and bags of food, prepared sandwiches for lunch, sorted and organized clothes in the thrift store, and helped at an ice cream social. At PATH, clients can get support in employment, outreach, housing navigation, and interim housing. Why Does the Word of God Bounce Off Us? Fr. Tom Mckenna of the Eastern Province of the Congregation of the Mission, in a post that originally appeared on FamVin, reflects on our obstacles to listening. One of the most gratifying compliments is to hear that you listen well. It conveys another’s feeling that something of his or her inner self has gotten through, that not just the words but the deeper resonances of those words have registered. Shallow listening habits are many and include such things as claiming the other’s experience (“That happened to me too and I know all about it”), not tuning into the feeling under the person’s voice, concluding that you’ve heard it all before, being mentally elsewhere, and so on. Fuller listening takes practice, discipline, openness, and a willingness to drop preconceptions. In Luke’s gospel especially, Jesus praises listening and is critical of its opposite. The Pharisees have been after him for a “sign,” some clear-as-day revelation of God’s power. And Jesus goes back at them for their tone-deafness to the sounds of God ringing through their ears right then and there. He cites Jonah whose preaching in the streets of Nineveh caught the hearts of the hard-hearted citizens of that town. He brings up this foreigner Queen who when she walked into Solomon’s court dropped her certainties and let herself be moved by the graciousness of his wisdom. But now this God-filled person in their midst, Jesus himself, speaks God’s Word directly to them — and it bounces off. How is it that people so close up to the human presence of God can miss the force of his words and actions? It’s a question for anyone who would follow close behind the Lord Jesus. What preoccupations deaden our hearing to the words he speaks — and The Word he is? There’s what we might call over-familiarity. Because we’ve heard these gospel stories countless times over, it’s a temptation to think there’s little newness left in them. But as carriers of God’s limitless word, they have a depth and scope that always reaches out beyond our full comprehension. New situations in person’s life can shake new meanings out of these texts. New conditions in society can unlock significance previously missed. Plain old growing older causes a listener to hear these proclamations from this different ledge in life. Listened to with care, Gospel words can peel back the filters familiarity pastes on them. Another is insufficient preparation, not getting ready. It’s been age old Christian practice to do things like: slow down one’s breathing, put oneself in the presence of God, express thanksgiving, ask the Spirit for openness, visualize the gospel scene, etc. Heartfelt listening requires a shift of consciousness, a move away from what’s taking my immediate attention to attune to what is being said. The hectic, hyper-connected pace of modern living raises the ante here. Not to slow down before approaching the Word of God most often blunts its impact and deadens its saving sound. A third is having too narrow an expectation of where the Word is being spoken. For sure that saving message comes in the Scriptures and through the sacraments and religious reading. But as the Creator’s very presence, it shows itself in many more places. Vincent for one could read God’s writing on the hearts of the neglected of his time. Thomas Aquinas could decipher it in the writings of people outside the pale of Christianity. Theresa of Avila caught its demands in her work of organizing and stabilizing. Pope Francis detects it not only in the riches of nature but also in the emergency rooms of this world. God’s Word plays in ten thousand places, says the poet, and the effort to listen with a wider hearing is the call Jesus issues all through his ministry. It’s those two distraught people walking the Emmaus road who put a face on Luke’s lesson. Tempted to “know it all” even before the Stranger begins to explain, they hold back and strain to keep their ears open to what he says. Doing that, they are soon enough opening their hearts to Who He is.